MAJOR CRIMES TNT’s hit drama series returns tonight with a brand new episode called, “Return to Sender.” On tonight’s and the first of a two-part story the squad races to stop a serial killer before he strikes again. Did you watch last week’s episode? If you missed it we did and we have a full and detailed recap, right here. On last week’s show a year-end blowout sale became literal for a used-car lot after one of its owners was killed when a bomb exploded. While the squad tried to find who is responsible, Rusty donned a bullet-proof vest under the watchful eye of Lt. Chuck Cooper (guest star Malcolm-Jamal Warner), a Special Investigation Section (SIS) supervisor, in an attempt to catch the person responsible for threatening his and Sharon’s life. On tonight’s show the squad must work quickly to track down a serial killer before he strikes again. Meanwhile, things get dangerous over a game of chess. Malcolm-Jamal Warner guest stars. Tonight’s episode of Major Crimes is going to be great and you won’t want to miss it. So pop some popcorn, grab a snuggle buddy, and definitely tune into this hot new series! While you wait for our recap, hit the comments and let us know if you are excited about this new series. 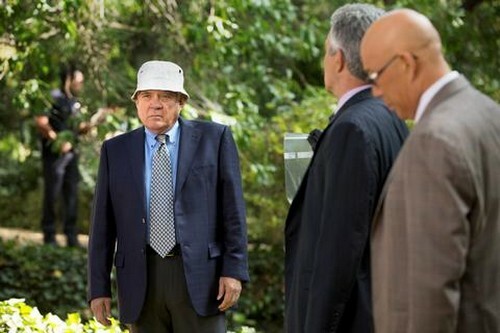 Tonight’s episode of Major Crimes opens with a shady business deal. A man is delivering a “message” and receives $1000.00 for the transaction. The message is “You haven’t scared the boy off with your the letters. You have one week to get rid of the boy or the woman. They’re both being watched.” A man named Phillip Stroh sent the messenger, after the message has been delivered, the man receiving it stabs the messenger to death, wraps his body in plastic, and dumps it in the river. Lt. Provenza and his team arrive at the river to fish the body of the messenger out of the river. They think the victim’s death is gang-related. Kendall reveals that they are unsure of the time of death because he was wrapped in plastic. They can tell by the footmarks that Jesus (the messenger) was killed by one man. They realize that the plastic Jesus was wrapped in belonged to a couch-cover, and that he was stabbed by a “big knife.” They realize that this is not the first body they have found with the same MO and couch-cover, the previous victim was named Kieth Mapleton. Another convict was stabbed with the same knife, and wrapped in a couch cover, his name was Russell. They think they have a serial killer on their hands. They try to trace the manufacturer of the couch-cover. Sharon is reviewing videos of Rusty again, he is back at the park and playing Chess. A man named Bill joins him to play a game of Chess, it is the same man that stabbed the messenger. Bill is smart, he plays music on his phone “to help him concentrate,” they can’t hear him over the surveillance tapes and Sharon and her team have no idea what Bill is saying to him. Bill is pretending to be an undercover cop, and he quizzes Rusty on how long he is followed by the team to learn when he can attack him. Monica, Jesus’s baby-mama comes in for questioning. She says that yesterday Jesus “went to help a friend.” They break the news to her that Jesus has been murdered. She is hysterical, and doesn’t believe them. Monica reveals that Jesus left to deliver a message, and he was going to be paid $2000.00 for it. He had to bring a spiral notebook and a box of pencils with him, to prove that the message was real, not just any pencils, #1 pencils with a special lead and a specific brand of paper. Sharon and Andy are shocked, they put two and two together and realize it is the same kind of paper and pencil that is being used to write the letters to Rusty. They share their discovery with Chief Taylor, Taylor is shocked that the letters and the serial killer are all linking to Phillip Stroh. Now that Sharon knows how dangerous the letters are that Rusty has been receiving, she is uneasy about sending Rusty out to the park to play Chess. Rusty is annoyed that Sharon is being so paranoid, with video surveillance, cops in the park, and a bullet-proof vest he feels invincible. Rusty heads to the parking garage to get in his car and drive to to the park. He sets up his chess-board like any other typical day. Sharon’s team has found a link between the three dead convicts, they each took a trip to the infirmary right before they got out of jail. They think that a convict named Reyes, a janitor in the infirmary approached the dead convicts while they were getting medical attention. They bring Reyes in for questioning. They show Reyes pictures of the three murder victims, and he claims he doesn’t recognize them. Sharon and her team know that Stroh has been giving Reyes free legal assistance in exchange for his assistance with the messengers. After some convincing Reyes confesses that he was passing messages for Stroh. Reyes has no idea what the messages were he was sending, or who he was sending them to. A fourth body turns up, with the same couch-cover and knife wounds. The victim, Gregory, is different though. He has never been to jail. They have no idea how he is linked to the letter writer. The team pulls up his last known address and employer, and head to the bar he used to live at. They are shocked to learn he lives in the same building as Sharon and Rusty. Rusty is on his way home from the park. Bill hops in the elevator with him, and pretends he is part of the police team. He tells Rusty he is in danger, and convinces him to head into a different apartment with him. Rusty has no idea that he is in danger. The letter writer tries to stab Rusty but rusty manages to get out of the way. Sharon kicks in the door, and rescues Rusty, the letter writer (AKA “Bill”) hops out the window and gets away. They set up a perimeter, but were unable to catch Bill, he is still on the loose. Sharon heads home with Rusty, and tries to apologize to Rusty for getting him involved in the operation. She had no idea how much real danger he was is. Sharon breaks the news to Rusty that they were unable to catch the killer and he is still on the loose. Lt. Provenza arrives at Sharon’s and they break the news to Rusty that he has to move out of Sharon’s and into Provenza’s house. They also reveal that he has one week to prepare himself, he is going to court to testify against Phillip Stroh in just a few days.